Your move, Thomas the Tank Engine. Most of us -- even well into adulthood -- are still waiting for our invitation to Hogwarts School of Witchcraft and Wizardry, but one lucky family of Muggles scored a free ride on the Hogwarts Express after a canoeing trip went awry. According to the BBC, Jon and Helen Cluett and their four children were enjoying a getaway in Lochaber, in the West of the Scottish Highlands, when a swollen river swept away their canoe. Weighing up their options to safely return to their car, the Cluetts decided the best choice would be to phone for help. "In the end I decided the only option was to phone the police and mountain rescue, ask if they have any local knowledge that could help us out," Mr. Cluett told the BBC. "The amazing thing was it wasn't just any train. 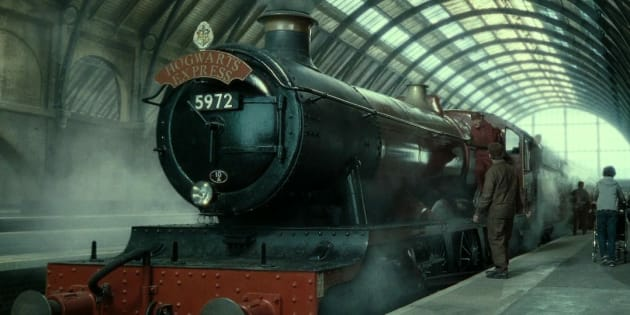 The next train that was passing was the Jacobite steam train -- the Harry Potter, Hogwarts Express steam train that goes up and down that line." Yep, the train used in the Harry Potter movies, the Jacobite steam train rescued the family like some kind of magical saving grace. Obviously the Jacobite is the train that was used in the movies, with the iconic shot of it travelling across the Glenfinnan viaduct synonymous with the trip to Hogwarts. While the kids obviously had an amazing magical adventure, Mr. Cluett was still mourning his missing boat. "I'm slightly sad because I'd lost my boat -- but the kids, when they saw the steam train coming, all sadness left their little faces and was replaced by excitement and fun -- just the real joy of having an adventure and having the train stop right next to them."